Yarn and Fiber Happenings: New Ivy Brambles Superwash Chunky Arrives and Warm Hats Patterns to Knit and Crochet! New Ivy Brambles Superwash Chunky Arrives and Warm Hats Patterns to Knit and Crochet! Stay warm in this perfect hat! The Roundabout Hat offers warmth and comfort in an easy to knit slip rib that knits up in hours. The Roundabout Hat instructions provide a perfect fit for all ages from children through adult. Use one skein of Ivy Brambles Hand-Dyed Superwash Worsted Merino Wool in any of the fabulous colorways including the new colorway Elegant Black. Looking for a chunky superwash merino wool? It's here! Ivy Brambles Chunky Superwash Wool is our newest addition and it is fabulous! Ivy Brambles Superwash Chunky Yarn is a deliciously soft hand dyed bulky/chunky weight yarn that is machine washable (cool) and dryable (low heat) designed for quick knit sweaters, and accessories desiring a chunky/bulky weight yarn. This is truly a spectacular yarn! 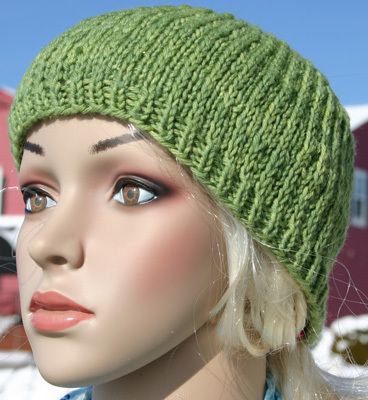 New pattern are pouring in for this yarn including the Easy Knit Watchman Cap Pattern! This hat takes only one skein of the Chunky Superwash Yarn and is finished before you know it! It is hard to make just one as the colors are spectacular! The Chunky Superwash Yarn is available in many of the Ivy Brambles colorways including the new Elegant Black and Royal Purple! Do you crochet? The new Ivy Brambles Loo-Strife Rolled Brim Crochet Hat Pattern is for you! Quick and fun to make, this crocheted cap features a rolled brim and wave pattern. Instructions include sizes to fit a child through adult. 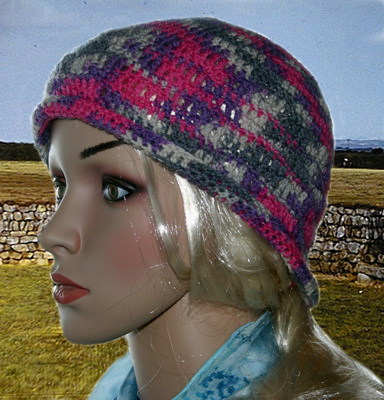 Easy and light, this hat was made using one skein of Ivy Brambles Sockscene yarn and a US F crochet hook. Hat is shown in the Dark Nebula colorway. Need to make a baby gift? 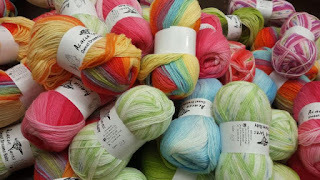 We have added the TLC Essentials Acrylic Baby yarn to our stock... all colors are available including Sparkle, Multis and Solids. This yarn is perfect for baby blankets, layettes and childrens apparel. It has a beautiful lustre and an ultra soft hand!